Ha! If only it was a simple as the title of this post says. However, it is possible to save money: by not getting sick. The cost of a doctors visit, plus medication (even if you have insurance) can be a huge bust to your budget – and definitely, throw your debt payoff plans out the window. The thing is everyone gets sick at some point or another, and it seems kids get it the most often – but unless there is an underlying reason there are a lot of things you can do to help prevent getting sick and kick an illness to the curb pretty quickly. In July when we moved to Indiana, our family of 4 was without health insurance until October. It was terrifying. The only thing keeping me from panicking was knowing that we could sign up for Cobra insurance and “backdate it” if there was *god forbid* a major accident – but that would have cost a fortune, and done some serious damage to our future financial plans. For those 3.5 months, I was worried about any of us getting sick. An ear infection would have cost us hundreds of dollars, strep throat, a whole lot more! So there were a few things that I did *above and beyond* normal to make sure we stayed healthy the whole time. Let me begin by saying that I am not a germaphobe. Not by any stretch of the imagination. I, however, do not like being sick. Can you relate? Simply wash your hands! During cold and flu season wash them a little extra. You should already be washing them after ever bathroom use, and before preparing or eating meals. Add in two to three extra hand washes a day to help thwart off cold flu bugs. Also – I do not care what kind of soap you use. I do not care if you use all natural or extra antibacterial – just wash them for at least 20 seconds, with warm water – and make sure you get between your fingers and under your nails. Teaching your kids the handwashing habit might be the single biggest thing you can do for them to prevent getting sick. Get as much all natural Vitamin D as possible. The best way to do this is the sun! I know that in the winter it is rare, but when you have the chance to soak up some rays, grab it. Even when it is too cold outside, but the sun is shining I have been known to open the front door (Keep the glass storm door shut) and sit on the floor in the sun while playing or reading to the kids. Epsom salt is a mineral compound (magnesium sulfate) that is absorbable through the skin. It helps aid in inflammation reduction, muscle pain, and can give your immune system a boost! Once or twice a week during the kid’s bath, I will toss in two handfuls of Epson Salt into the bathtub. I like to think of this as an insurance policy. If / When the kids do get sick I put extra salt into their bath, as it makes their body aches feel better, and overall system boost. The best budgeting technique I’ve ever tried! Best apps to save money on groceries! How to create a magical Christmas when you have no money! Almost everyone thinks orange juice when they think about a superfood for immunity. You can buy orange juice right at the grocery store. But I love the option of juicing your own and throwing in some other superfoods like carrots, and berries. Your kids will absolutely LOVE making their own juice – it will be healthier – and you can customize it! Cut back on your sugar intake! Eating or drinking too much sugar curbs immune system cells that attack bacteria. This effect lasts for at least a few hours after downing a couple of sugary drinks. I know it won’t be easy with all the holiday treats around, but simple acts of replacing one soda with a bottle of water – one cookie with some veggies or an orange instead, could have a powerful impact on your overall health this winter. Plus, we all know it is just better for you in the long term!! I am a true believer in the power of a humidifier. When the winter comes – the heat gets turned on – the air in your house dries out. Your body, especially your throat needs moisture to perform its functions at its best. Using a humidifier at night when you are going 8+ hours not drinking any water, and likely mouth breathing will have a huge benefit on your overall feeling as soon as you wake up, as well as throughout the day. IF you do get sick, make sure you are using one, even throughout the day. A humidifier was recommended to us by our doctor a few years ago, and I could see an instant impact on how we felt in the mornings! I have no knowledge or expertise in essential oils. I do have a diffuser on my wishlist and have been reading up on them. I do believe in natural healing powers in certain cases. And I am always for the benefits of using all natural when possible. So I am doing my research, and hope to be breaking into essential oils in the new year! If you have any recommendations on where I could start to educate myself, please let me know! Keep the air in your home clean and fresh. No, I do not mean Febreeze but rather detoxed! I like the idea of using salt lamps to make breathing easier, and houseplants to clean the air. I am also a fan of opening up the windows even in January, for 20 minutes or so just to air out the house. It is also important to change out the air filter in your heating system! So it might seem silly to think about how to save money: by not getting sick. 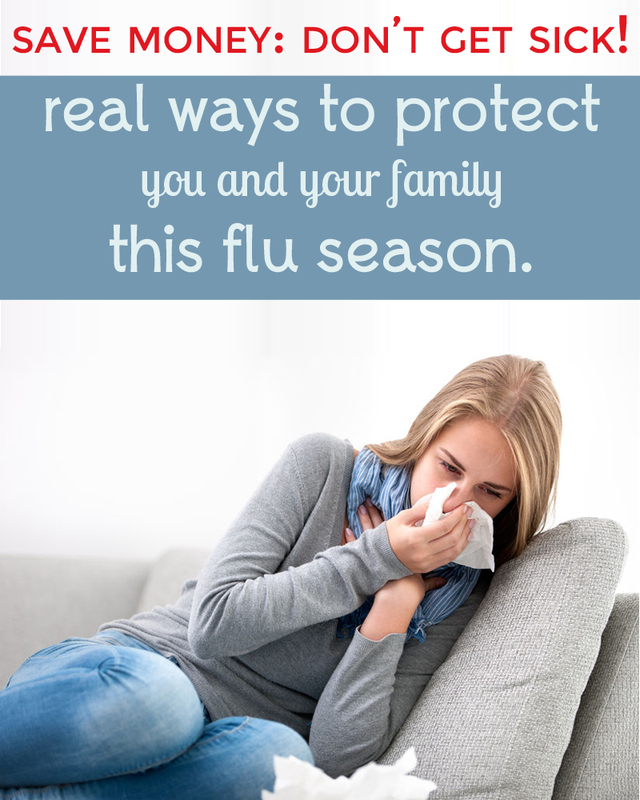 However, some simple precautions, and tiny step to help prevent the cold and flu from taking down your house is WELL worth the savings on your bank account – the savings of your time (From being ill) – and it is well worth not having your lives and plans disrupted. I’d love to hear your tips to prevent getting sick! Let me know in the comments below.